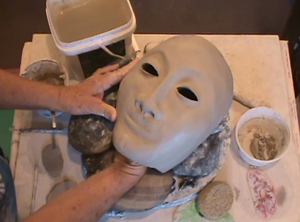 As is often true for many clay artists, I have loved playing in dirt and mud for as long as I can remember. I am descended from women who all liked to do the same. On my father's side (such hard-working southern Baptists) was my dear Auntie Rachel who would actually travel the circus route so she could collect elephant manure for her garden. On my Hawaiian mother's side was my Auntie Tahoney, who was rooted to the 'aina - the land - and everything that grew and blossomed. And then there was my beloved mother, Tutu, who was the first person to teach me how to make mud pies. I work in clay because it’s a natural extension of this familial passion for mud playing and gardening, where I create, cultivate, and make things grow. I like squishing my hands in clay and I have been doing so since the mid 1980s. 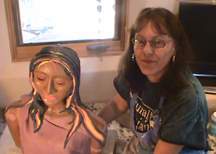 I love creating garden sculptures, garden art, and pottery to enjoy outdoors, but all of my work goes equally well inside. I am engaged by the human form, not so much by its shape or dimension, but how it can reflect an inner spirit or essence in a very simple way. The real and imaginary beings in my Global Village are examples of that. I moved to New Mexico from California on the toss of a coin in 1976; thank goodness the coin turned up ‘heads’, otherwise I’d be in Eugene, Oregon right now. Not that Eugene isn't stunning; it's just that the sun shines in New Mexico approximately 320+ days out of the year. For a person like myself whose moods are so intensely connected to the climate, for the last 40+ years I have contentedly lived in Santa Fe, New Mexico and for the last 14 years in the Cerrillos Hills outside of Santa Fe, with my husband Archie, 3 mustangs, 4 dogs, a bratty cat, 2 bee hives, and a 125-lb. African sulcata tortoise named Frankie. All my larger scale work is done in Cone 6 stoneware clay with paper fiber added for strength and resilience to the extremes of New Mexico weather. I don’t create maquettes or plan my work in advance. I value the freedom of changing my mind, a detail, or even a whole concept in midstream, and the flexibility of paper clay helps me retain that free-flowing quality. Each and every piece is lovingly hand built and unique. Please email or call for additional photos so you can get a complete look from every angle.